After a bit of a decent start in the first two weeks of the regular season, the Big Ten wet the bed in Week 3. Specifically, the Big Ten West Division had a miserable weekend while the powers in the East Divison fared just fine. 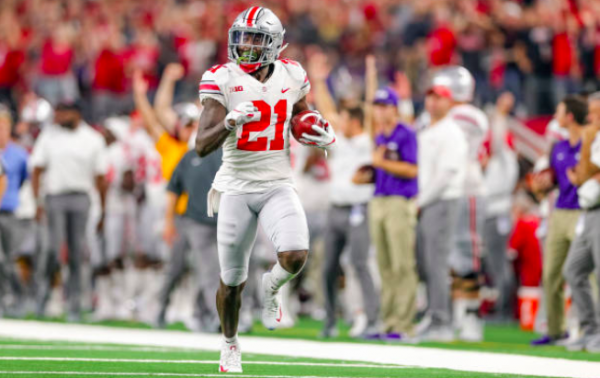 Ohio State overcame some adversity and let their depth and athleticism carry them to a victory over TCU in Arlington, and Penn State and Michigan blew away their overmatched opponents at home (Michigan State was off a week after losing at Arizona State). Aside from those three, Iowa, Minnesota and Indiana, there was very little to be proud of in the Big Ten this weekend. Wisconsin took a loss at home to an unranked BYU (BYU is now in the AP Top-25 though), snapping their 41-game winning streak at home against non-conference opponents. Maryland was run over at home by a Temple team that had lost home games to Villanova and Buffalo to start the year. Rutgers was obliterated by Kansas… KANSAS! Nebraska lost at home to Troy, dropping to 0-2 under new head coach Scott Frost and really putting a dagger in any chance of being able to play in a bowl game before even getting to a challenging Big Ten schedule. Purdue played an entertaining game at home against Missouri but lost on a last-second field goal by the SEC’s Tigers. Northwestern lost at home to Akron, with the Zips winning their first game against a Big Ten team since the 19th century. With the Big Ten taking a conference-record seven losses in the same weekend, the conference was easy to pick on. But it’s important to keep something in mind when taking everything into consideration. The easiest case to make is the conference taking so many punches to the gut in one weekend will have any actual impact on the fate of a team that shined in the spotlight in the same weekend down the road. As our pal Allen Kenney said on Twitter, lumping Ohio State’s playoff chances in the same boat as what happened to any team in the conference is unwise. I could not agree more. While no team will control their own playoff fate, as far as I’m concerned, the Buckeyes can easily put together an impressive playoff profile the selection committee will have to evaluate at the end of the season as long as they take care of their own schedule. It won’t matter that half of the conference took a loss in Week 3 if at the end of the season Ohio State is holding the Big Ten championship trophy after going 13-0. Even a 12-1 Ohio State would still stand a reasonably good chance of being one of the four playoff teams invited by the selection committee at the end of the season. Will a weekend like this come back to haunt Ohio State? If the 2014 season has taught us anything, it probably will not. Sure, there’s the possibility a weekend like this dings the strength of schedule formula to a degree, but the Buckeyes already have one win over a top-15 team under their belt and they’re going to get a few more cracks at adding high-profile wins to their collection, notably in two weeks when they visit Penn State. Penn State can also take care of their own business and have a strong playoff shot at the end of the year. So could Michigan. And so could Wisconsin. Yes, Week 3 sucked for the Big Ten as a whole, but the conference’s top playoff contenders either remain firmly on the radar (Ohio State, Penn State) or will have to wiggle their way back into position over the course of the next two and a half months (Wisconsin, Michigan, Michigan State). As was the case in 2014, there’s simply too much football left to suggest the Big Ten has a narrow shot to land a team in the playoff. The Big Ten West was not alone in a pit of misery this weekend. The Pac-12 South took a few lumps as well. Utah gave Washington a battle in Salt Lake City, but the Utes couldn’t avoid failing to capitalize on opportunities presented by the Huskies and lost at home with just seven points to show for it. USC looked like a mess on the road against a Texas team that hopes they finally figured something out (but we all know the Longhorns could just as easily take a step or two back this week against TCU). Arizona State promptly lost their first game of the season in the same week the Sun Devils made their first appearance in the top-25 under Herm Edwards. And Chip Kelly fell to 0-3 in his new gig at UCLA, losing 38-14 at home to Fresno State. But hey, at least Kevin Sumlin got in the win column at Arizona by blowing out an FCS program by 31 points. And Colorado moved to 3-0 with a 31-point victory over another FCS school in Boulder. Sometimes you take what you can get. And like Ohio State in the Big Ten, Washington still can take care of their own business and not have to worry about what happens in the rest of the conference. Although, the Huskies already took a loss this season against Auburn, who just lost at home to LSU on a last-second field goal. I don’t know what it is about LSU and Ed Orgeron that always comes back to haunt me. I look at the Tigers and never see a team I feel I should take seriously as an SEC or playoff contender. In fairness, playing in the same division as Alabama, that has been an easy case to make more often than not. But here we are three weeks into the season, and LSU has smashed Miami on a neutral field and won on the road against the team I felt would give Alabama the most trouble this season. It’s true. Orgeron continues to rack up some quality wins, but LSU is still a program that has the unenviable task of trying to get by Alabama to make any serious national championship or playoff push, let alone an SEC push. But could this Tigers team be any different? The early returns suggest Joe Burrow may be the best game-managing quarterback Orgeron has had to work with, and he came through in the clutch when LSU really needed him to make some plays against Auburn. The concern is why Burrow can’t get in a groove during other parts of the game. When LSU faces a team like Alabama or Mississippi State (or Texas A&M? ), the Tigers may not be able to afford any stretches of down time from Burrow and the offense if they’re going to keep this thing going. But already with two wins against top-25 opponents away from Baton Rouge, you can easily argue LSU has the best resume going right now if you focus mostly on on-field results. Are they better than Alabama or Georgia or Clemson or Oklahoma or Ohio State? No, most likely not. But would you take LSU’s three wins over the wins accumulated so far by the Crimson Tide, Bulldogs, Tigers, Sooners or Buckeyes? If not, you’re kidding yourself. Defense was optional in the Texas Tech-Houston game. So was officiating, apparently. Take a look at this play on the first drive of the second half, when Houston successfully throws two forward passes and doesn’t get penalized for it. I saw The Meg the other night, and it looks great! Hawaii made the longest road trip in college football this past weekend with a flight out to West Point, New York for a game with Army. Unfortunately for Cole McDonald and the Rainbow Warriors, they had to endure the longest possible flight back when their rally fell shy by seven points. After the game, however, Hawaii head coach Nick Rolovich was as classy as can be with his kind words for their opponents. If we had to lose a battle like that, glad it was to @USArmy. Thank you for testing our will, and thank you for what you do for our country. I love our team for the effort they put on the field. They emptied the tank for each other. I genuinely love when college football programs pay their respects to Army, Navy, and Air Force before, during and after their games against the various service academies. We need more of that. On a related note, it was nice to see Temple honor the memory of former Maryland football player Jordan McNair for their game at Maryland (which was also Maryland’s true home opener to the season). I suspect we’ll see other teams pay their respects to McNair in some capacity throughout the season, especially in Big Ten play, and I love seeing that. That’s two straight wins for Kansas over FBS opponents. The last time Kansas pulled off that feat was nearly a decade ago. FYI: Last time #Kansas won back-to-back games was 2011 with a 2-0 start to the season with wins over McNeese State and Northern Illinois. Last time Kansas beat FBS opponents in consecutive weeks was 2009 (opened season 5-0). Kansas has scored 30+ points against FBS non-conference opponents in consecutive games for the first time since Sep 12 and Sep 19, 2009. Rutgers has been on the receiving end of some absolutely brutal losses since joining the Big Ten, but I believe this loss to Kansas may be the worst loss of the Chris Ash era of Rutgers football. The Group of Five race is on! Boise State certainly had a chance to create some separation with UCF in the polls this weekend. It turns out they did just that, but not the way they wanted. The Broncos took a loss on the road against Oklahoma State. On top of that, the Cowboys ran away with the win to make things look a little more damaging for Boise State. The dream of playing in the College Football Playoff is now dead for Boise State, but the Broncos still should have a good chance to play in a New Years Six bowl anyway. They’ll just need someone to knock off UCF at some point. UCF had their game against North Carolina scrubbed due to Hurricane Florence, so the Knights watched all of the action around the Group of Five from home. That action included some interesting developments. For starters, the MAC’s most likely top contender, Toledo, whiffed on their own upset bid by losing at home to Miami. Houston went down against Texas Tech, but wins by South Florida and Temple against Big Ten schools and Cincinnati improving to 3-0 and schools like Memphis and Navy winning big at home made for a decent weekend for the AAC overall. The Mountain West had some ups and downs too. In addition to Boise State’s loss at Oklahoma State, the Mountain West saw Hawaii lose at Army, Colorado State get blown away by Florida, and Wyoming struggle to beat Wofford. On the other hand, the Mountain West also saw the conference go 3-1 against the Pac-12, including a lopsided win by Fresno State (at UCLA), San Diego State upending No. 23 Arizona State, and Nevada edging Oregon State. But now, every team in the Mountain West Conference has at least one loss, while there are three undefeated teams in the AAC (UCF, Cincinnati, South Florida). That helps keep the AAC in the better position to send its champion to the New Year’s Six bowl game this season, but we know there’s still so much football to play. After watching everything unfold up through Week 3, I still feel confident in suggesting the top five teams are standing on their own level right now, which means somebody has to be left out of my top four. However, I was forced to shake things up a bit this week after my previous No. 1 team (Auburn) lost for the first time this season. And because I tend to base my ranking a little more on wins to date than other particulars, I’m introducing a new team to my current top four. Yeah, that’s right. Alabama is left out. So is Clemson. LSU has two of the best wins out of any of these teams at the moment, with both coming against top-25 teams away from home. Ohio State surges up with their win against TCU in Arlington while blasting their previous two opponents (both Power 5 teams but bottom-feeders in the Pac-12 and Big Ten). I’m giving Oklahoma a slight edge over Georgia despite both having a decent road win in conference play and two blowouts in addition, but Georgia comes behind Oklahoma for now because the Sooners have faced three FBS opponents and Georgia racked up one win against an FCS foe. Alabama hasn’t played an FCS opponent, and they have absolutely destroyed their competition so far. But until the Tide plays someone a little more intimidating, or until one of these teams above takes a loss, Alabama will have to wait for their turn back in my top four. The same goes for Clemson, although their win at Texas A&M would actually have them ahead of Alabama and sitting in fifth place for me right now. UCF vs. FAU – This should be a fun game Friday night. It also carries some Group of Five implications with it. Missouri vs. Georgia – Can the Tigers pull off a big upset against Georgia to open up a wild race in the SEC East? Wake Forest vs. Notre Dame – Irish have a running game, but if Wake can take it away, Demon Deacons could pull an upset. Michigan vs. Nebraska – Is Scott Frost about to go 0-3? Purdue vs. Boston College – Boilermakers are entertaining but 0-3. Here comes AJ Dillon and Boston College. Alabama vs. Texas A&M – Aggies gave Clemson a run in College Station. Can Jimbo fire them up to put a scare in Alabama? Ohio State vs. Tulane – Only notable because Urban Meyer will be back on the sidelines for the Buckeyes. Final tune-up before Penn State. West Virginia vs. Kansas State – Mountaineers were washed out by the hurricane, so an extra week to prep for Bill Snyder’s Wildcats. Texas vs. TCU – After a nice win against USC, can Longhorns can’t take a step back against TCU. Kentucky vs. Mississippi State – Two 3-0 SEC teams. Something’s gotta give. Oklahoma State vs. Texas Tech – Bet the over? Oregon vs. Stanford – Bryce Love got Week 3 off with the Ducks on deck. Oregon QB Justin Herbert already has 12 TD passes. Iowa vs. Wisconsin – A night game in Kinnick Stadium a week after losing at home to BYU? This could be tough for Wisconsin. Washington vs. Arizona State – Can Herm Edwards fire up the Sun Devils after his first loss?